This is truly one of the most beautiful townhomes that popular 'River's Walk' has to offer - located in the BEST LOCATION within the complex overlooking a TRANQUIL, EXPANSIVE GREEN SPACE this gorgeous Town home is only 1 year old! 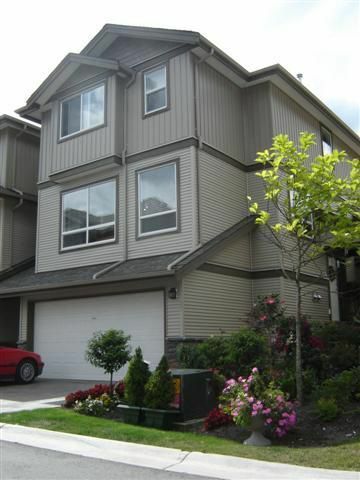 Featuring 3 bedrooms, 3.5 baths on 3 levels this END UNIT is loaded with upgrades! Boasting laminate flooring + 9' ceilings throughout the main level, gourmet kitchen with granite countertops, upgrade gas stove, sakura range hood and ice/water fridge - relax in the adjacent family room with cozy gas fireplace. Upstairs offers 3 spacious bedrooms with the master offering a large walk -in closet & ensuite with soaker tub. Enjoy the rare offering of the LARGE, DAYLIGHT, WALK-OUT BASEMENT with rec room & full bath with deluxe shower - perfect for guests, 4th bedroom or home office. Relax or entertain in the HUGE, PRIVATE & FULLY FENCED backyard. A double garage PLUS parking for 2 extra cars, wired throughout for audio/video system, built-in vacuum system + more, make this home a must see!